Love the colors and it feels great. Have it under a dining table and it has already proven easy to clean. This user was entered into a sweepstakes after submitting their honest review. 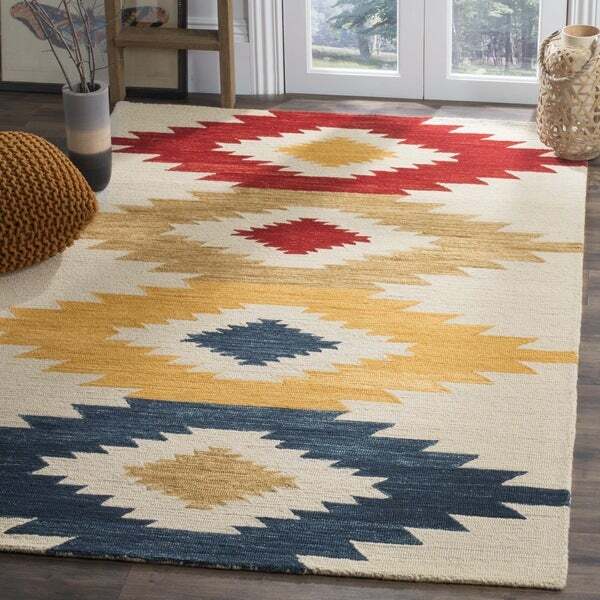 Inspired by the cozy ski lodges of Colorado, the Aspen Collection features fashionable geometric tribal patterned rugs. Using main accent colors of red, blue, and yellow on an ivory backdrop, skilled artisans hand-tuft these wool rugs for exceptional clarity of color and design. This rug looks beautiful, feels wonderful but I haven’t taken it out of the package yet because my children bring their dogs over and don’t take their shoes off. We haven’t had that discussion yet. Love the colors and it feels great. Have it under a dining table and it has already proven easy to clean.